The single fact that you clicked on that link to come here shows that you are brave. 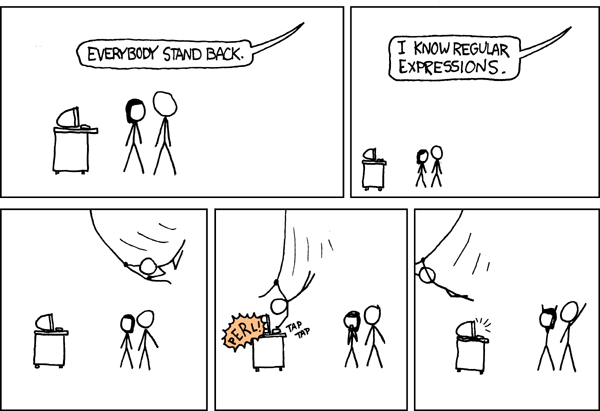 Most people just run away when it comes to regular expressions. They are wrong to do so! Not only are they extremely valuable, but their foundations also are actually quite easy to grasp. 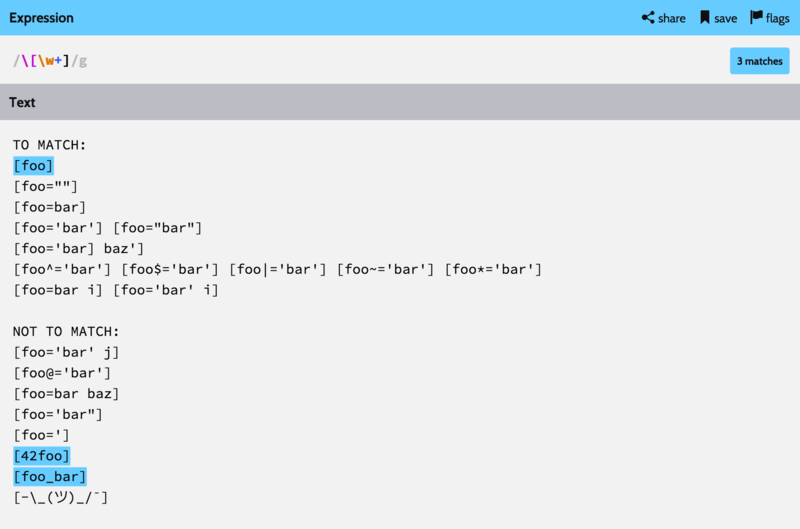 However, regular expressions are hard to read, if not to say barely decipherable. That’s why I thought an article on the basics of regular expressions would not be such a bad idea after all. And to avoid the very theoretical approach, I feel like actually building a regular expression the hard way from the ground up would be a good way to learn. In case you are not entirely sure what this is all about, allow me to put you back on track. A regular expression, often shortened as “regex” or “regexp”, is a sequence of characters that define a search pattern. Because of their usefulness, regular expressions are built-in in most programming languages. A very practical example would be a regular expression to validate an email address. 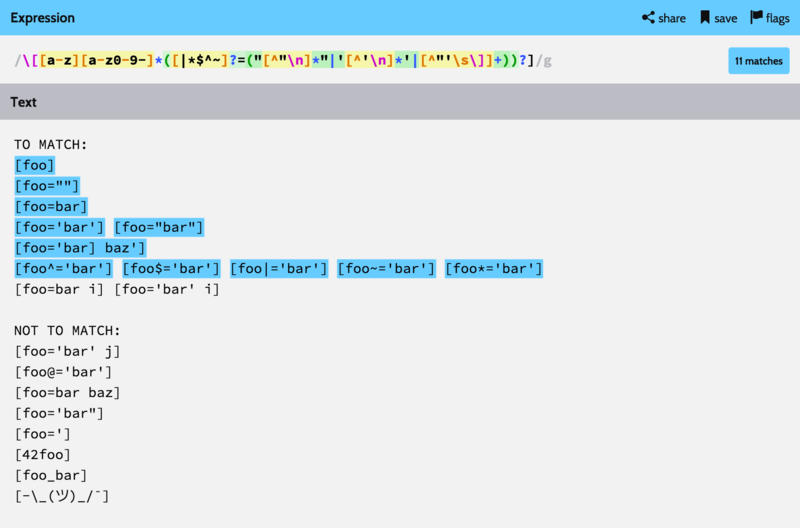 Note: to play with regular expressions, I highly recommend Regexr which not only is extremely well thought, but also provides a handy reference as well as a way to save a regular expression for sharing. 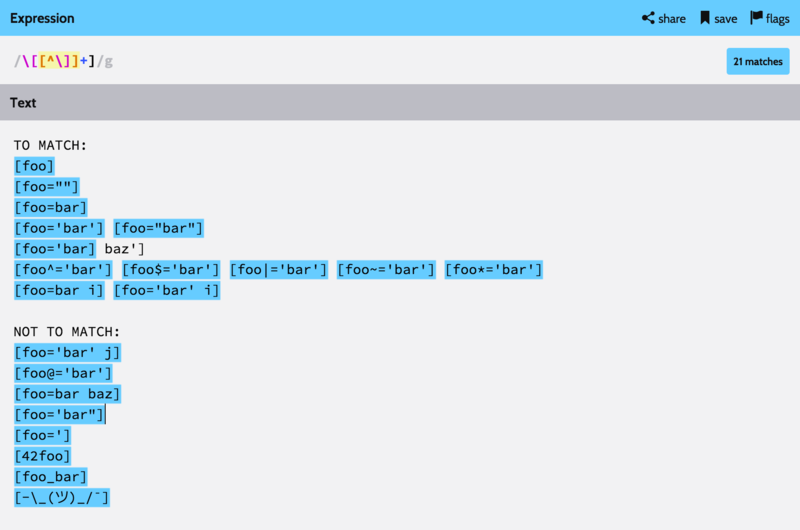 There is also Regex101 which is a great tool to fiddle with regular expressions. Alright? Let’s get started slowly but surely. Note: for sake of readability, I omitted the PCRE delimiters (/.../) from all regular expressions in this article. We also won’t talk about flags as they are basically irrelevant to this discussion. Let’s start easy. We want to match an attribute selector that only checks for the presence of the attribute, without checking its value, such as [href]. To do so, we are looking for a word inside of brackets. Matches any word character (alphanumeric & underscore). Only matches low-ascii characters (no accented or non-roman characters). Equivalent to [A-Za-z0-9_]. \[: matches an opening square bracket. The leading backslash is a way to escape the next characted. It is needed as [ has a special meaning in regex. \w: matches a word characted which is basically a lowercase letter, an uppercase letter, a number or an undescore. +: matches the last token (here \w) at least one time. Here, we want to imply that we need at least one character. ]: matches a closing square bracket. As there is no unescaped opening bracket, this one does not need to be escaped. So far so good, right? Let’s check our test list to see how our regular expression performs. This bracket mess literally means “find an opening square bracket, followed by anything that is not a closing square bracket, followed by a closing square bracket”. To do so, it relies on a negated set that we will see more in-depth in the next section. Broadly speaking, it is more than enough to find attribute selectors in a stylesheet but we didn’t learn much! Also, this version captures a lot of poorly formatted selectors, as well as some false-positive results as you can see in the next image. Let’s try to match a valid selector! To match a value, we need to check for the presence of an equal sign (=), then a series of at least one character that is not a closing square bracket (for now). To match anything that is not a specific character we use a negated set, written as: [^X] where X is the character you do not want to match (escaped if needed). A negated set is a way to match any character that is not in the set. Matches 0 or 1 of the preceding token, effectively making it optional. Like many languages, CSS does not enforce a specific quote style. It can be either double (") or simple ('). Actually most of the time, quotes can be safely omitted! It is the case for attribute values, as long as they don’t contain any specific character. It is best practice to put them anyway, but our regular expression should make sure it works for valid unquoted values as well. a double quote (") followed by anything that is not a double quote or a forbidden line break (using the \n character class), then a double quote again: "[^"\n]*". or a single quote (') followed by anything that is not a single quote or a line break, then a single quote again: '[^'\n]*'. or anything (yet at least 1 character) that is not a double quote, a single quote, a space-like character (using the \s character class) or a closing square bracket: [^"'\s\]]+. Acts like a boolean OR. Matches the expression before or after the |. It can operate within a group, or on a whole expression. The patterns will be tested in order. CSS Selectors Level 4 introduces a flag to attribute selectors to discard case-sensitivity. When present, this option tells the browser to match no matter whether the case is matching the requested one. This flag (noted i) must be present after at least 1 space right before the closing square bracket. 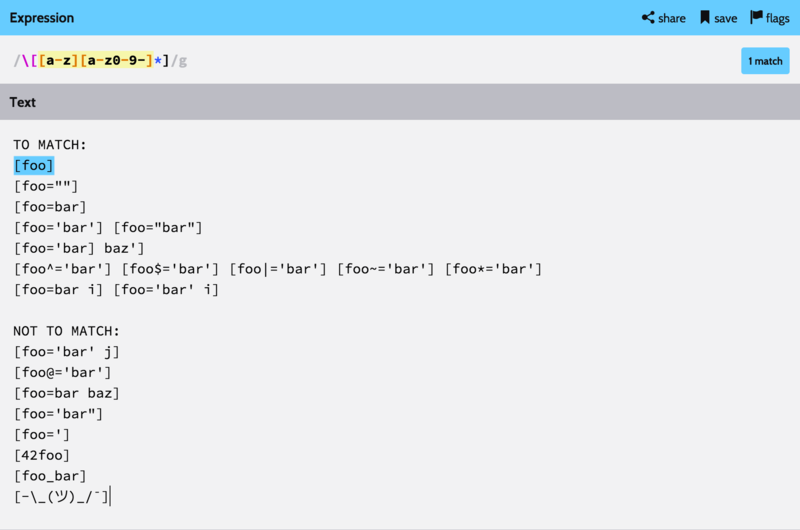 Testing for it in our regular expression is actually super easy using \s+i. Regular expressions are not exclusively made for matching and validating content. They are also super useful when it comes to capturing some dynamic content as part of a search pattern. For instance, let’s say we want to grab the attribute value in our regular expression. Groups multiple tokens together and creates a capture group for extracting a substring or using a backreference. You might be confused as we already used parentheses in our expression but not for capturing. We used them to group tokens together. This kind of behaviour is what makes the language of regular expressions difficult to grasp: it is not regular, and some characters have different meanings depending on their position or the context they are used in. If we want to grab the value only, without the possible quotes, we need to move the capturing group inside the quotes. Depending on the purpose of the regular expression (validation, capture, etc. ), it might be interesting or even needed to use capturing groups to grab content from the matched patterns. That’s it! 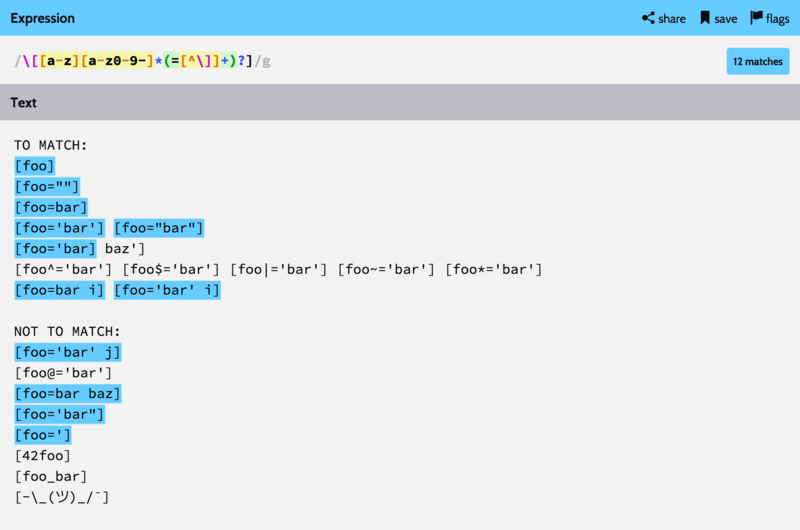 The final state of our regular expression is able to correctly match and validate a CSS attribute selector. I have run some tests on it and could not find a reasonable way to break it (as long as the selectors are sticking to what is allowed by the CSS specifications). As you can see, it is not that hard to write a decent regular expression, especially when you take it slow and build it step by step. Do not try to rush the perfect solution right away. Start with the basic match, then enhance it to deal with more complex scenarios and edge cases. It is worth noting that the difficulty with regular expressions is usually not to write them but to read them, and thus maintain them. Therefore, it is highly recommended to extensively unit-test code snippets relying on regular expressions. It can be a huge time-saviour when updating a regular expression to have a few dozens of tests making sure that the behaviour didn’t break. I hope you learnt a few things anyway. And if you find a way to improve it, be sure to share in the comments!